An onlay featuring a beautiful classic Fleur de Lis. We can customize and place into other products, let us know by e-mail inquiry. 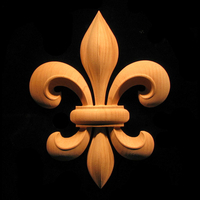 Carved wood decorative Onlays, Appliques and Plaques are carved standard in unfinished material in the wood choice selected. Paint grade can be any hardwood available at our shop including wood that may be off color. Stain grade is generally uniform color, knot free wood and may include poplar or beech. Parts are made to order and lead times are generally 3-5 days till shipment. Rush orders are accommodated as much as possible. Shipment is from Oregon. Heartwood makes every effort to provide accurate shipping costs and reviews all assigned shipping costs with FedEx and UPS actuals to check for accuracy of address and rates charged and will notify if a shipping charge needs editing for additional charge or credit. Custom requests are welcome by inquiry and may incur additional design fees. Discounts available for larger or wholesale quantities, please inquire. Returns -We do not accept returns without prior authorization and approval in advance. Returns may be subject to a 25% or greater restocking fee for standard parts that are returned undamaged. Return value is based on parts only and excludes shipping charges. All charges and responsibility for returns are borne by the purchaser and are also non-refundable. Custom parts are non-returnable and non-refundable. Do you need to customize this product?